SURPRISE, Ariz. - Royals reliever Tim Collins will seek a second opinion after an MRI exam revealed ligament damage in his left elbow, while second baseman Omar Infante was headed for his own MRI because of continued soreness in his right elbow. Collins, who left his spring training debut Wednesday, was competing to be the situational left-hander in the Kansas City bullpen. The exam taken the following day revealed the injury, and the Royals will decide whether Tommy John surgery is an option after the second opinion. "Not much else you can do about it, just go with what the trainers want me to do," Collins said. "We're going to get a second opinion and go from there." His injury could clear up one of the few remaining position battles in Royals camp. Brian Flynn and Brandon Finnegan are also competing for the bullpen job. 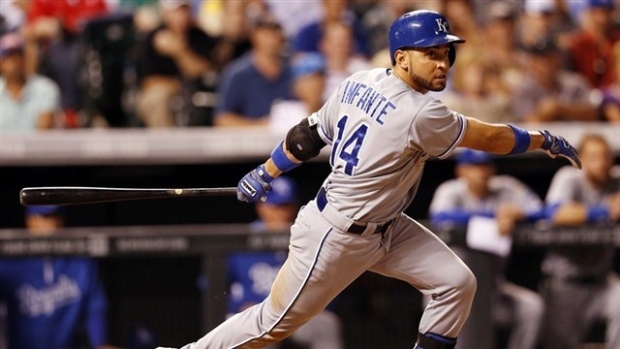 Infante has been dealing with elbow soreness since last season. He was expected to start the Royals' game against Cleveland on Friday at designated hitter, but will instead have tests to try to determine the nature and severity of his injury. "It's not ligament. That leads you to believe that it's a spur in the back of the elbow that's inflamed," Royals manager Ned Yost said. "Is an injection warranted to calm it down? Did a spur break off? We just don't know. We have to send him out for an MRI and see exactly what is causing the pain." Infante said that he doesn't feel any pain when he's hitting. In fact, he can take ground balls and full batting practice without any trouble. "Only thing I can't do is throw," Infante said. "I think I'll be OK."
Ryan Roberts was expected to start at second base in the Royals' spring training game against the Indians on Friday. Christian Colon is also capable of playing the position.